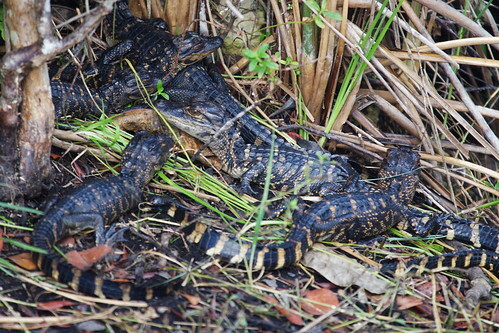 Gator Babies, originally uploaded by Frank Peters. Shark Valley in the Everglades National Park is a neat place where you can walk along the trail and see dozens of gators lazing along side. We'd stopped to take a picture of one gator and noticed movement just beyond her in the grass and spotted these little fellows. Eventually we noticed that there was another baby on the other side of the trail...and that we were standing right between it and its mother. At that point we got real nervous and decided to give the whole family its space. A good start..., originally uploaded by Frank Peters. Dawn of the first day of our Christmas vacation. Our hotel in Ft. Lauderdale is right on Pompano beach. The weather forecast calls for sunny and about 80 degrees...pretty miserable but I suppose we shall have to make do somehow. Kofi, originally uploaded by Frank Peters. 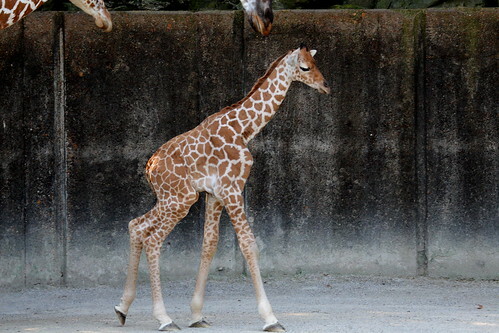 The Memphis Zoo has a new baby reticulated giraffe. His name, Kofi, means "boy born on Friday." Those fortunate to be at the zoo on Friday, August 29th got to witness the actual birth as it took place in the viewing area. This is Marilyn's first actual child. A couple of years ago she adopted another giraffe, Angela Kate, when her own mother (who was older) rejected her. Angela Kate didn't know what to make of Kofi at first and even seemed a bit frightened. She has since adjusted and now follows Kofi around everywhere and pokes and nudges at him. Kofi seems to bear this with an admirable stoicism. Delicate, originally uploaded by Frank Peters. 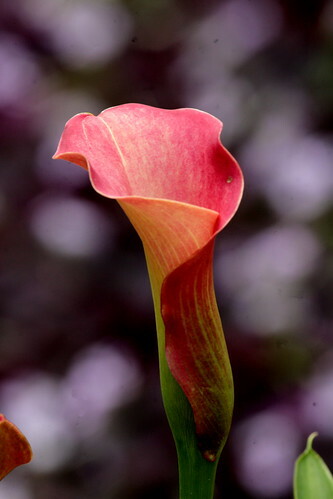 This flower was in a fountain in in a botanic garden in Dayton, Ohio. We were in town for a wedding of distant relatives that we discovered through genealogical research. As I took this photo at the Memphis Zoo I was struck by how far we are removed from our primitive roots. Cranberry (what an awesome name for a mighty polar bear) weighs in at well over five hundred pounds. Reason says that any mother should be utterly terrified to see her child just inches from such a powerful predator. When you stop and look at it, this picture should be frightening. 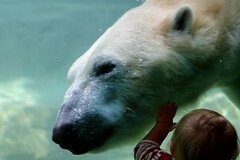 But no, Mom was tickled pink to see her child trying to 'pet' the cute polar bear.